The ADX is an indicator that measures the strength of a trend. 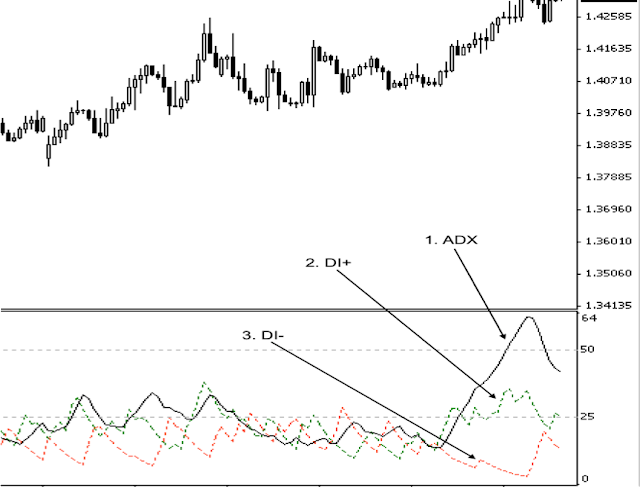 The ADX does not determine if the trend is bullish or bearish, but can indicate if the market is trending. The 3 lines measure price action in different ways. The main ADX line (Solid Black) is non-directional and is used to quantify the strength of the trend whether it is trending up or down. 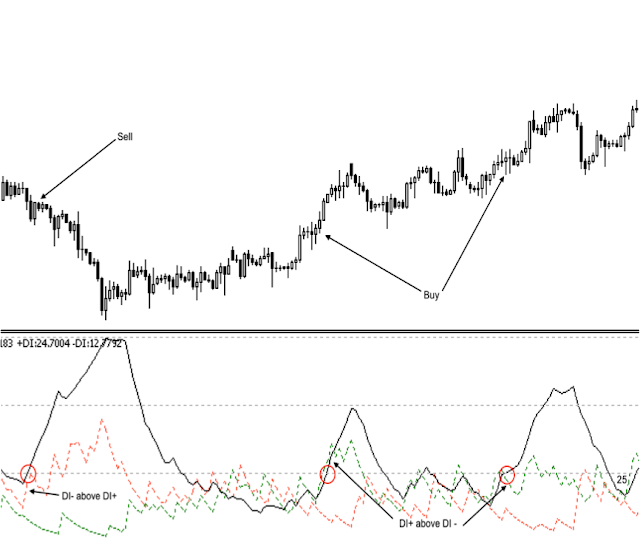 ADX readings above 25 suggest a strong trend. When it is below 25, it indicates that price is in consolidation and there is no trend. DI stands for Directional Indicator. They are used to confirm if the trend is bullish or bearish. The DI+ line (Dotted green) measures the strength of the uptrend, while the DI+ line (Dotted red) measures the strength of the downtrend. The ADX can create buy or sell signals when the ADX line moves above 25. As seen from above, traders can either buy or sell depending on which DI line is above the other. Traders can sell if the Dl- is above the Dl+ line. Conversely, traders can buy when the Dl+ is above the Dl- line. The Dl lines can produce buy or sell signals when they crossover each other. The ADX line also confirms the bullish or bearish trend when it is above 25. When the Dl- line crosses above the Dl+ line, it signals the start of a bearish trend, and traders can sell. When the Dl + line crosses above the Dl- line, it signals the start of a bullish trend, and traders can buy. 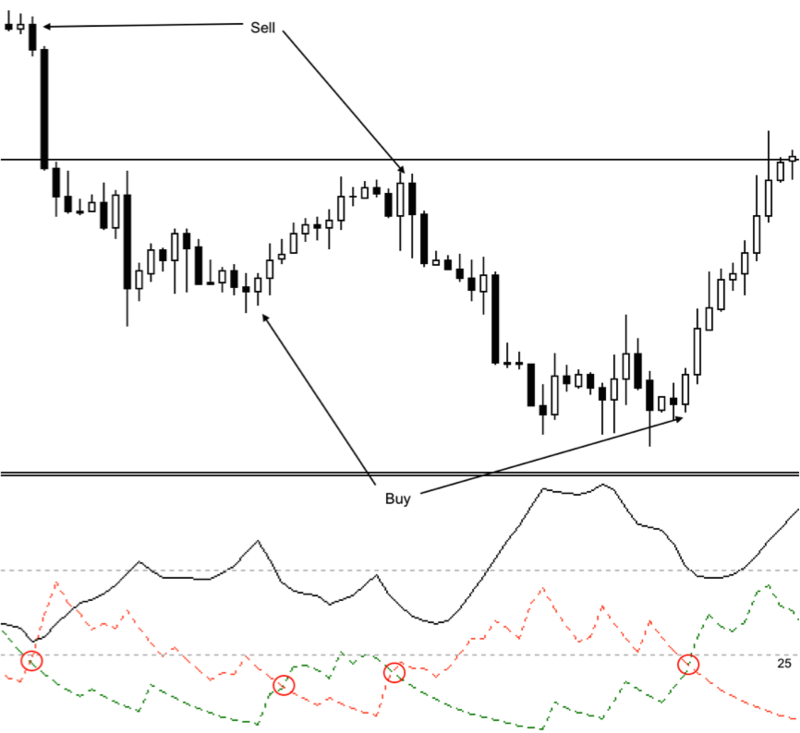 It is also important to ensure the ADX line is above 25 before entering the trade.